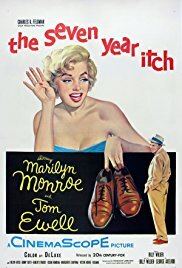 If you haven’t seen this classic Marilyn Monroe movie you are in for a treat! When his family goes away for the summer, a so far faithful husband is tempted by a beautiful neighbor. Join us at the library, where it’s nice and cool, on Tuesday, August 14th at 1:00 p.m.
Come take a break from the summer heat and enjoy some popcorn and laughs! next post: Movie Matinee – Book Club – Tuesday, Sept. 11 – 1:00 p.m.